Flower girls and ring bearers used to be staples at weddings. I still remember mine from when I got married over 17 years ago. In fact, my flower girl got married this year. Unfortunately, they seem to have fallen by the wayside a little, which is sad as they bring so much to wedding festivities. For this Preston Woodall house bride, her flower girl and ring bearer provided some cherished moments as well as some wonderful laughs during their ceremony entrance. 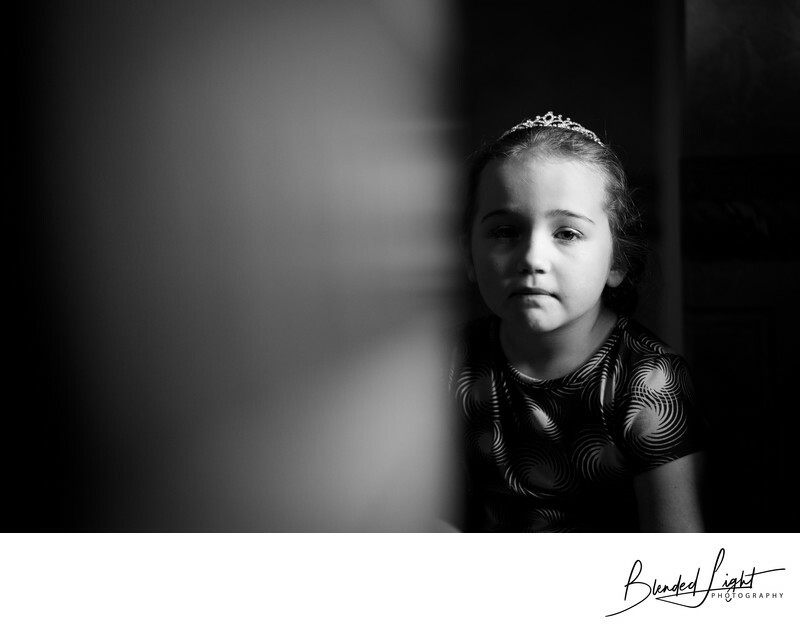 As the bride was getting ready, I noticed her flower girl sitting by herself, waiting for her chance to get dressed. As she sat near the corner of the room, the light from a window began lighting the side of her face closest to it. With such contrast between the bright side of her face and the side in shadow, I paused from the bride to create this lasting, dramatic image. What makes this image so thought provoking? It starts with the leading line of the wall drawing your attention to the subject of the image. Next, the drama created by the light. The contrast of the dark shadows on one side of her face with the bright light on the other side and the perplexing look on her face leave a lot to the imagination. The last piece is the glistening of her head piece adding another degree of light to the image. Ever wonder what a child is thinking? I can only imagine the thoughts running through this young lady's head. When will she get married? Where will she be wed? And who will her groom? Actually, she's probably not thinking about any of those questions. I'm venturing a guess that it's more along the lines of "When will this day end? ", "Are they having anything good to eat?" or "How do I make sure I do not get this dress dirty?". This young lady and her brother would later have a pretty funny entrance to the wedding. As they walked in, side-by-side, the young lady was gently dropping her rose petals to the ground, just as a good flower girl should. In stark contrast, her brother was taking them by the hand full and throwing them over his head as high as he could. The crowd loved it and it provided a great laugh for everyone. Even the groom was amused. Even without the serious nature of the image above or the comical entrance she and her brother provided the guests, the two would have still combined to be a huge hit at the reception. Their dancing moves off the hook and they had so much fun out on the dance floor with the adults! Weddings are rich with tremendous opportunities for gorgeous photography. While my focus during most of the day is my bride or groom, I do take time to look at the entirety of the day and try to ensure that moments aren't missed. Because, when you are not looking and watching, things can be overlooked. This image is a great example of something that shouldn't be overlooked. Location: 201 E Hill St, Benson, NC 27504. 1/640; f/2.0; ISO 1600; 85.0 mm.